"Oh, yeah, he knew he was going to die. And his son came to see him at the hospital. He wanted him to come. And do you know what he said to that boy? Why, he told him, "Be strong! 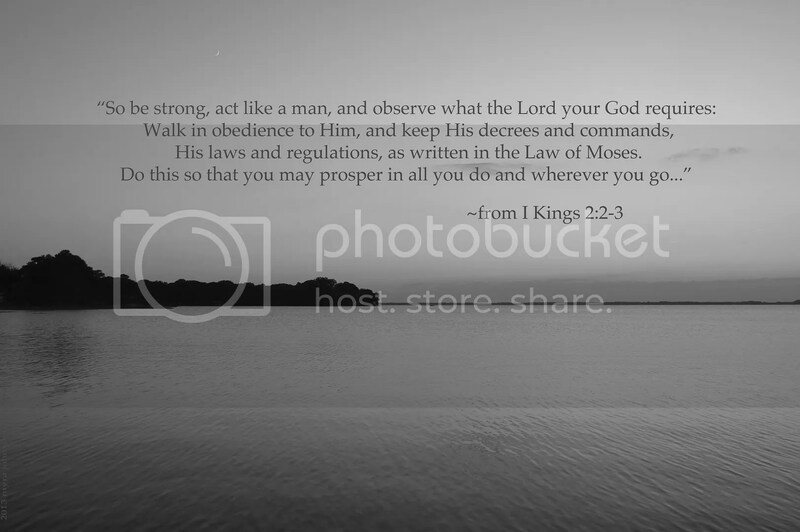 Act like a man…." What if this was all the conversation that you heard? What if these people walked out of the restaurant just after they said these words? What would you suppose "Be strong and act like a man" meant? Go a step further and answer what being strong and acting like a man means to you personally. In the book of 1 Kings, we find the account of David as he is nearing death. His son, Solomon, is with him. So, what words would the leader of a great nation have to say before he dies? What words would a loving dad have to say to his son? "So be strong, act like a man…." When the time drew near for David to die, he gave a charge to Solomon his son. 2. Act like a man. 3. Observe what the LORD requires. 4. Walk in obedience to the LORD. 5. Keep the LORD’s decrees and commands. If I read this list in reverse, it would seem to suggest that keeping God’s commands and being obedient to Him is defined as being strong and acting like a man. Is there any "strength" greater than devotion to God? Along with other instructions, David chose to leave his son with these words. What do you think you would say?